Lewis Dijkstra, Deputy Head of the Economic Analysis Unit from DG REGIO presented the goals of the European Cities Report which shows European cities in a global perspective and will help cities to compare themselves. Moreover, he underlined that this publication will support the Urban Agenda for the EU and provide input to the HABITAT III conference and support the New Urban Agenda. During the presentation, the structure of the report and the main findings have been commented in details. During the discussion which followed the presentation, participants showed a great interest in the data collected. 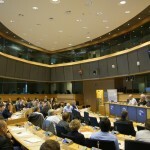 Members of the European Parliament underlined that the report clearly shows where some problems in the European cities are. Jan Olbrycht, President of the URBAN Intergroup, stressed in conclusion that the report will be very useful during the elaboration of future regulations: “we need to have these analyses to make policy choices in the future, to know where to invest”. The report will be officail launch in October.